A magnificent property to rent whatever holiday you're looking for. A modern, spacious, 5* townhouse with 2 king size bedrooms, which easily convert to accommodate 4 single beds. Ideal for either families or golfers. The ground floor boasts a romantic sun terrace which overlooks the golf course and the Almanzora valley beyond. Relax on the sun terrace watch the golf, or enjoy the beautiful sunset behind the mountains while enjoying some local sangria. There is a selection of DVDs and novels available, or if you're feeling energetic there are a variety of leisure facilities on your door step to enjoy. The property is newly built, with quality fittings and furnishings, and without doubt located in one of the most attractive locations on the resort. The huge roof-top is a perfect sun trap, furnished with sun loungers, table, chairs and a huge parasol for the scorching mid-day sun. The attractive pool is 30 seconds walk, yet not too close to disturb you. You will not be disappointed! I bought the property off plan in 2005, after simply falling in love with Desert Springs resort. I class myself as fairly well travelled, and a regular user of hotel accommodation in the UK and abroad. It is important for me to provide holiday accomodation that I would myself be impressed by, and enjoy. Every effort is made to ensure the booking procedure, information and directions etc are provided, but most importantly ensure that our guests can relax and savour the surroundings at Desert Springs in a home from home enviroment. We have a representative who lives within a mile of the property who is there to help in the event of any emergencies. Her contact details will be provided prior to arrival. This property has the best views on the resort ! Its pearched high above the 1st and 18th fairways, so keeping an eye on the golfers is fun. The views form the property over the area onto the mountains are amazing. The sunsets ... perfect. The house is furnished with a modern interior, nothing drab here ! There is a flatscreen tv with all the expected UK channels, including CITV etc for the kids. There is a playstation with loads of games, loads of DVDS for all the family.Wireless internet, Air con throughout and ceiling fans to help keep you cool. Its fresh, modern and fully equipped ! Bathroom 1 - Toilet, full size bath with shower, separate shower enclosure, bidet & sink. Bathroom 2 - Toilet, shower enclosure. Bathroom 3 - Toilet. Fireplace, sofa bed seating for 4 people. Child's highchair, dining area seating for 6 people. DVD, TV, satellite or cable, radio, Playstation 2, stereo system, CD, audio tape player. Bosch cooker/hob, washing mchine & dishwasher, Full size fridge/freezer, Microwave, Iron & Ironing board, & airer. Charcoal Bar-b-q on patio. As well as Desert Springs there are a selection of golf courses within the locl area. The resort itself has floodlight tennis courts, basketball, volleyball, football, golf practice area, driving range and golf school. The 18 hole arizona styled golf course really is a golfers dream! Notes on accommodation: Kids are well catered for and are welcomed everywhere. The property keys and holiday information pack will be posted directly to you prior to your departure. Outside: Terrace, balcony, parking, tennis court, 10 garden chairs. 2 sunbeds on the roof top as well as 2 foldable sunloungers within the property to take to the pool or beach. BBQ (charcoal). Utility Room: There are a set of right and left handed golf clubs available for use, as well as 2 tennis racquets, tennis balls and a football to avoid hire charges. Cleaning / Towels / Linen / Maid service: Cleaning costs are included within the rental rates, however if necessary a further deduction will be made from your security deposit if the property is left in an unacceptable manner. Any additional cleaning or linen change required is chargeable. Other: Although the property itself is non-smoking, there are ample terraces etc for you to enjoy your relaxing habit! We spent 10 days in this townhouse with our 2 children (6yrs and 4yrs) and we had a fantastic time. The resort itself was peaceful despite it being mid-late August, and we had free access to a lovely communal pool which was never too busy. It's very well-kept and clean, with beautiful bright flowers and huge cacti of all kinds everywhere. The service is great in both the resort restaurant and the Crocodile Club, with good food, friendly staff and nice surrounds. The house itself was perfect for us - 2 spacious double bedrooms, 2 bathrooms and a handy downstairs toilet, a roomy living area, modern and well-equipped, aircon where you need it... All very clean. Having a few basics in the kitchen cupboard on arrival was appreciated too. There was plenty of space for us and the kids, good wardrobe space, easy parking...it was a great place to come home to after a long, hot day in the sun. We would stay here again in a flash! Thank you for your kind words, I am so pleased you enjoyed the resort and property as much as we do ! Your welcome back anytime ! Beautiful property very well equipped and perfectly located . We had an amazing two weeks at this property with beautiful views. We had a choice of two balconies to relax on and the Crocodile Club and Club House was a walkable distance for evening drinks. Will definitely be back. We stayed at the start of August 17 for 7 nights. The accommodation was perfect, lovely and clean with lots of facilities and in a great location on the resort. The shared pool area was immaculate and no fighting for sunbeds here! Sharon was extremely helpful despite my hundreds of questions before and during the stay, nothing was too much trouble. Joining instructions etc received well in advance. The crocodile club was a nice place for a meal and a couple of drinks. I would thoroughly recommend this accommodation and will also do so to my customers as I work in the travel industry. You will not be disappointed. A lovely relaxing holiday or lots of golf on a great course where my husband and boys spent a lot of time. Thank you! Thanks for your kind comments. It was a pleasure helping you with your holiday accomodation. I am really pleased you enjoyed your holiday. A lovely accommodation in a great part of the resort. Perfect for families... loved the house, the golf and the pool areas... not to mention the on site food and drinks! Glad you enjoyed your holiday. It was a pleasure dealing with you. Thanks for your booking. Thanks for taking the time to complete a review. Pleased you enjoyed your stay. 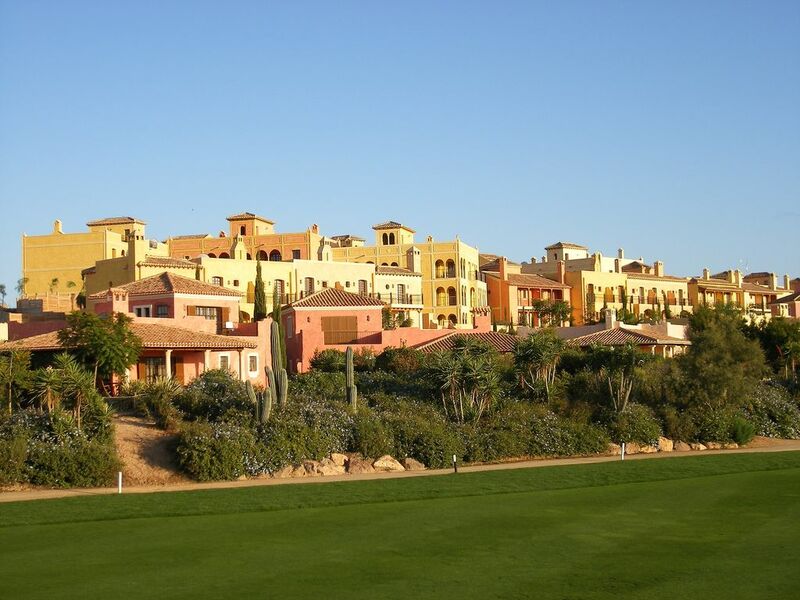 Desert Springs golf resort is located on its own private desert oasis, yet is only 10 minutes from the Costa Almeria coastline. Nearest airport Almeria at 80 kilometres. Nearest motorway Cuevas del Almanzora Exit 525 E15 at 10 kilometres. After leaving the resort you can explore the local villages like Palomares, the quaint fishing village of Villaricos or drive up the coast to Mojacar playa, where there is a wide variety of activities, restaurants and entertainment available. You may however prefer the hill top town of Mojacar Pueblo, where the panoramic views are breathtaking...a perfect place to enjoy the local tapas bars and restaurants. The water park at Vera, horse riding, the beach, Quad biking through the mountains, mini Hollywood where Clint Eastwood filmed and Beckham filmed the Pepsi ad...you name it, you can do it! Or if you prefer chilling on the beach or poolside its your choice. Booking Notes: A security deposit of £200 is required to confirm your booking. This will be returned to you in full, upon the property being inspected after your departure, and the keys are returned to the owner. Any damage/breakages/ lost keys will be deducted from the deposit. This will also act as a cancellation deposit and will not be refunded unless 6 weeks prior notice is given to the owner. Changeover Day: Changeover days are flexible, to give renters the options of using the low cost airlines into Almeria and Murcia. Please contact the owner and we will help where possible. However this can often be dictated depending on the departure day of the previous g Notes on prices: Prices are for the property per week in UK Pounds. The owner will accept Euros, payable directly into her Spanish bank account.